An utterly devastatingly beautiful epic love story!!! Endless Love Letter by Callie Anderson is no ordinary romance story. It is a story that will leave a permanent mark and stain on your soul. A story that will etch its words into your heart and make you see and feel that the LOVE of Weston and Emilia was a love like no other. It was endless. An endless love. 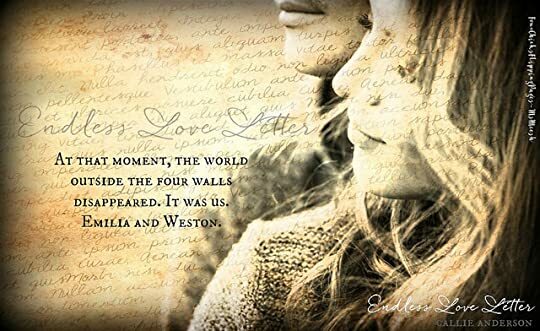 The story of Weston and Emilia will break, steal and touch your heart. It is a story that will leave you breathless and devastated. It is a story of two people who were made to love each other. A story where two hearts beat as one. A story of true love. A story of second chances. A story of life. I honestly don't know what to say because this book literally tore my heart into pieces. Shards of broken pieces were left in the aftermath as I absorbed the gorgeous and poignant prose of Ms. Anderson. I was devastated on how raw and real Ms. Anderson made the story of Weston and Emilia. I don't know whether to hate the author or applaud the author for writing a book that I surely won't forget. Ms. Anderson held my heart and soul hostage as she delivered one of the most beautiful epic love story that I have read. My heart was broken into pieces but slowly Ms. Anderson was able to mend the broken pieces as she slowly made her readers see the big picture of what life entails. Though this book didn't have that happily ever after of hearts and flowers but she gave her readers so much more. She allowed her readers to FEEL. Feel the depth of love, truth, acceptance, and sacrifices that must be made when it comes to love and life. Endless Love Letter is a story that must be read and experienced. Experience the heartbreak, sadness, grief, anger, loss, love, and hope. There are no right words to describe this book because the story of Weston and Emelia is endless. It is a love story that lives within us. A reminder that true love exist and it's an endless kind of love because it truly never dies. It lives within our soul, memory and heart. So if you are looking for an epic love story that will grip your heart, stain your heart and etch every memory and words into your heart then I highly recommend you to read Endless Love Letter.